VHSE Admission 2019 for admission to Kerala Vocational Higher Secondary courses under the department of Kerala VHSE will be started after the publication of SSLC result. The VHSE admission process will be made through the single window application system / Ekajalakam VHSCASP 2019. The SSLC /10th class passed students can apply for the VHSE Admission Allotment by VHSE Online Application Registration. The VHSCAP online registration can be done through VHSCAP web site. VHSE courses are equivalent to plus two courses and they can go for any higher studies as like +2 students according to their eligibility scores. There are 389 vocational higher secondary schools are functioning in Kerala. 25 seats are available for each batch of VHSE courses. The candidates who are passed in SSLC or equivalent can apply for Kerala VHSE admission through VHSCAP Ekajalakam. The age limit for VHSE admission is 20 years and the relaxation of age limit is as per the government rules. VHSE Application form and prospectus are available from all the government / aided VHSE schools in Kerala at the prescribed cost. The eligible candidates must have to submit online application registration through VHSCAP 2019 / VHSE Ekajalakam. The candidates can submit online application through the vhscap 2019 web site www.vhscap.kerala.gov.in. 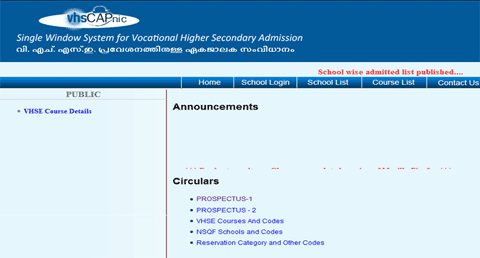 The filled application form has to be submitted to any of the VHSE school in Kerala. Do not need to submit more than one application forms to apply for multiple schools. Only one application is needed for apply to multiple schools. All the supporting documents should submit along with the VHSE application form. Submit the filled application form with all the supporting documents to any of the VHSE school in Kerala and keep the receipt of the application for later use. Admission process will be done through a centralized allotment process VHSCAP 2019. The allotment process will have three main allotments First allotment, second allotment,, third allotment and then VHSE supplementary allotment. The vocational higher secondary board will be conducting a VHSE trial allotment before the first allotment. After the VHSE Trial allotment the candidates can make necessary changes in school and course priority. The admission will be completed based on the allotment process.